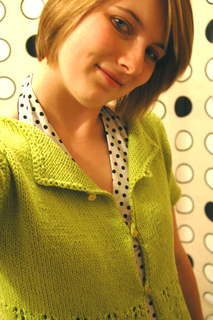 So called “Lucky” because this cardigan not only is knit in bright green yarn and features a lace pattern reminiscent of four leaf clovers, but also because this is my first original garment design ever! The piece is an easy knit that looks great on many different body types. This cardigan is knit from the top down in one piece (no seams!) and is adorned with raglan increases. 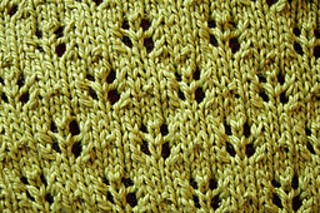 The eyelets are very simple and ideal for a beginner to lace knitting.